The PTFE brake hose is an integral part of aerospace and tough industrial environments. But do you know the right hose for different applications? If you aren’t here is a quick guide to how you can use PTFE brake hose in numerous applications. Why do you need to install braided stainless steel brake lines? This helps improve brake system effectiveness and shelf life when you compare it with other flexible rubber hoses. Hoses which has a core made of Teflon are known to deliver exemplary performance under severe conditions. So you can see the usage of PTFE hoses in the aircraft landing gear, space shuttle, braking systems, and breathing apparatus that firefighters use to keep themselves safe. Teflon hoses have numerous applications and they are characterized with the following points. As per different applications, Teflon hose is available with different types of braiding such as Monel, Stainless, or bronze braiding. Most often the hose is covered with thermoplastic, silicone, or textiles as and when needed. How would you Select The Right PTFE Brake Hose? Here are some of the characteristics that make use of PTFE Brake hose for different applications. So what kind do you require? The big advantage with PTFE brake hose is its incredible flexibility. When you require a tubing to change direction, you can opt for two things either bend it or put an adapter elbow on it. That causes an impact on the flow rates and also encourages pressure drop. The more components you add the more it affects the overall cost. A PTFE tube, on the other hand, has similar pressure capability but may not require joints and elbows. In a jet airliner, PTFE is usually used as a major fuel line. If the airliner meets with an accident, the fuel line won’t crack under pressure and do not end up causing a fire hazard. The flexibility of the hose means that that you can deal with an offset with ease, between any of the two elements of your system. Hoses are actually really important to designers and installers of fluid systems. PTFE is a tough nut to crack. It is usually corrosion resistant and can be easily cleaned. If you use it the right way it can have a long shelf life stretching for decades. It does not conduct heat as easily as stainless steel tubing, so it provides an extra dose of strength and reliability. 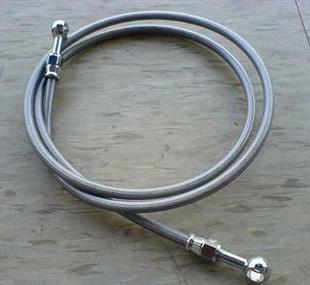 Braided stainless steel hose is much more expensive than rubber. 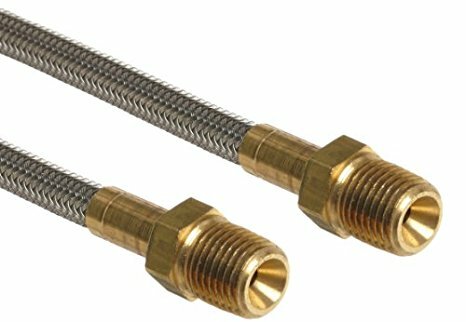 You will find that braided stainless steel brake lines can only be seen in upmarket motor vehicles, for example, hot-rods and supercars, or on race-prepped vehicles, the ones you find on Formula One and touring car series. Braided stainless steel brake lines is an after-purchase upgrade. This is typically bought and installed after purchase and not prior to it.